Chocolates, cookies, candies, and more. The East Bay seems to be exploding with makers and small businesses specializing in exceedingly gift-able sweets. Whether you're looking for an extra stocking stuffer or a main attraction, locally made treats are always a great way to go. Is there anything more in keeping with the holiday spirit? A quick note: We listed the price if you buy directly from the maker, but a third-party shop might sell these items for a little bit more. We're living at time when a fancy bar of chocolate can cost you $9. It's extra refreshing, then, to stumble upon San Leandro's The Tea Room. The small company blends tea with organic, fair-trade chocolate into its bars, and the result feels like a special occasion despite their relatively affordable price tags. This particular bar features green Earl Grey tea and 60 percent dark chocolate, and the bergamot and floral flavors manage to shine without overpowering the chocolate. Visit the website for a full list of retail options, which include stores from San Leandro all the way to Richmond. For the hot chocolate lover, pick out a quality hot cocoa mix and amp it up with some marshmallows. Oakland's Christine Pirrone makes her confections by hand in small batches, and the texture is so much lighter and more wonderful than the mass-produced, store-bought brands. This special holiday box includes nutmeg, cardamom, orange spice, vanilla bean, raspberry, chocolate, five spice, chai, and cinnamon rooibos marshmallows. Order it online or find The Candy products at Market Hall or Oaktown Spice Shop. Some people prefer to make their own desserts, and for those individuals, this baker-focused set from Oaktown Spice Shop should provide ample encouragement. 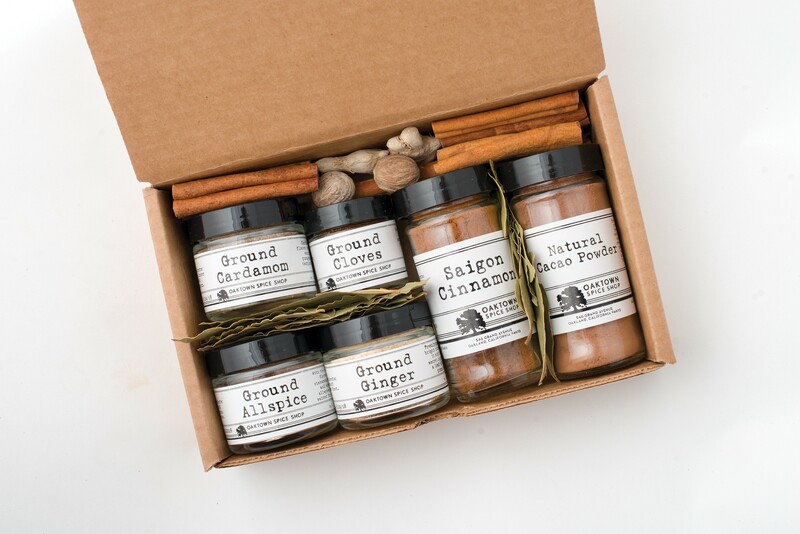 It includes cinnamon, cocoa powder, allspice, cardamom, ginger, and cloves, all packed into a sweet little box. Hopefully, your kind gesture will one day be rewarded with fresh brownies, cookies, or apple pie. Cassandra Chen learned to make caramel at San Francisco fine dining restaurant Jardinière. Fittingly, her caramels at Berkeley's CC Made are divine wonders of butter and cream. She makes a few flavors, but it's hard to go wrong with the classic caramels enriched with pink Himalayan sea salt. With their small size and cute packaging, they also make an ideal bonus gift for stockings. Order them online or find them at Market Hall Foods in Rockridge. A specialty from Piemonte, Italy, Baci di Dama adorably translates to "Lady Kisses." If only all kisses felt this rewarding. These little mound-shaped cookies are made from hazelnuts and almonds, with a layer of dark Belgian chocolate sandwiched in between. They're light, lovely, and subtly sweet. Chef Andrea Cesca started up his bakery in Berkeley after missing the flavors from his native Italy. You can order his Baci di Dama online or find them at Berkeley Bowl West, Farmer Joe's Marketplace on Fruitvale Avenue, or Farmstead Cheeses and Wines in Alameda. The melt-in-your-mouth Argentine cookies are a good choice year-round, but Wooden Table also carries special, festive flavors prime for gift-giving. You can get peppermint chocolate alfajores, with the cookies coated in dark chocolate and crushed candy canes, or shortbread versions covered in a pumpkin spice glaze. Order a box of 16 online or find them in the baking company's recently opened cafe. There, Wooden Table will also sell special cranberry and white chocolate alfajores — a treat solely for brick-and-mortar visitors. If you can't choose a flavor, there are always gift boxes. We all have the relative who tries to be healthy and pretends to stay away from sugar — and then you catch them gorging on cookies in the kitchen. What they really want is a bag of candied nuts, something that feels semi-healthy — protein! — but also completely satisfies that sweet tooth. Pick up an attractive bag from Anthony's Cookies in Berkeley for optimal crunch and a simple, nutty flavor. There aren't any extra spices here distracting you from sweetened pecan bliss. First, stop calling them "macaroons." Those are coconut cookies. French macarons are textural marvels: almond cookies with a barely crisp outer layer and soft, chewy interior, all enclosing a thin, flavorful filling. They are notoriously difficult to bake properly, but they're more durable than you might think for gift-giving purposes. 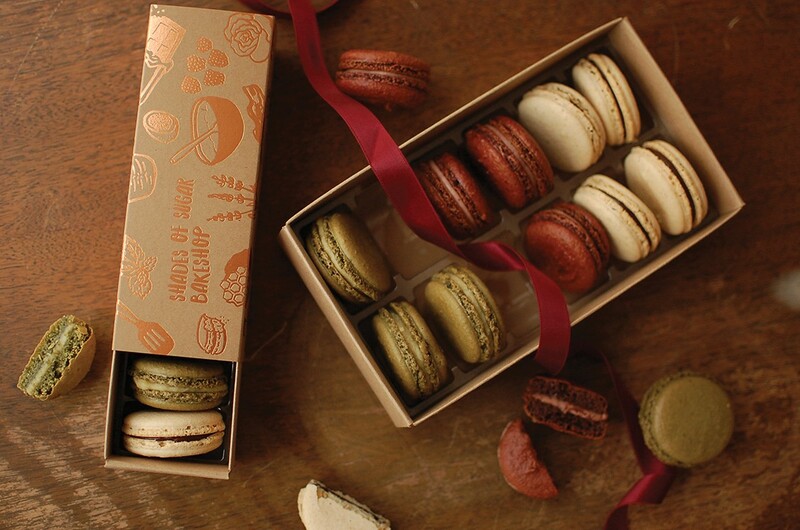 Eric Szeto of Shades of Sugar Bakeshop, a small start-up in Oakland, says his macarons stay fresh in the fridge for a week or in the freezer for up to a month. Shades of Sugar creates some exciting, unusual flavors, and its special holiday gift box delivers on festivities with the likes of peppermint, ginger pear, maple pecan, and matcha chestnut. Bonus: They're gluten-free. Order online at least one week in advance, and then you can pick up at the bakery or receive free delivery within Oakland.